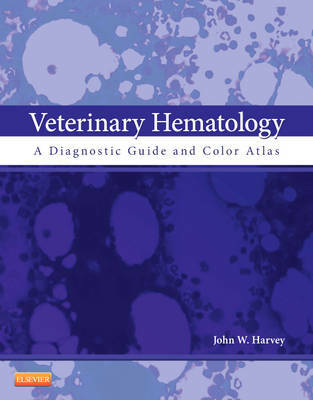 Combining essential hematology content with the diagnostic features of an atlas, Veterinary Hematology: A Diagnostic Guide and Color Atlas delivers all the information you need to accurately assess and diagnose the blood diseases of common domestic animals - including dogs, cats, horses, cattle, sheep, goats, pigs, and llamas. This all-in-one resource utilizes a clinically-oriented and user-friendly approach to guide you through the processes of selecting relevant diagnostic tests, collecting and preparing samples, interpreting sample results, and determining their clinical significance. High-resolution photomicrographs, full-color illustrations, and excellent schematic drawings, tables, and quick-reference algorithms help you clearly visualize these concepts and procedures. Two books in one gives you the information of a user-friendly, clinical textbook and the diagnostic features of a color atlas in a single reference. Practical, clinically-relevant text is comprehensive and yet concise in its delivery of vital information such as: Principles and procedures that are employed in recognizing normal, abnormal, and artifactual features of blood and bone marrow samples and developing accurate diagnoses Common cytochemical stains and summary charts for interpretation Sample collection, staining procedures, and diagnostic techniques Differentiating features of malignant and benign hematologic disorders Miscellaneous cells and blood parasites and their significance in the evaluation of blood smears Hematopoietic and non-hematopoietic neoplasms High- resolution photomicrographs and excellent schematic drawings, tables, boxes and quick-reference algorithms aid your understanding of basic clinical concepts and differential diagnostic considerations. Over 800 full-color illustrations help you clearly visualize the concepts and clinical features of the blood and bone marrow - from normal cell maturation to the development of various pathologies. "The user-friendly layout of clear and colourful headings and subheadings makes information easy to locate, and it is presented in an engaging manner...A real assest of this book lies in the apprendices, where the reader will find extremely? useful algorithims that provide at a glance diagnoses for commonly occurring haematological problems, such as regenerative? anaemia and plateley/ coagulation deficiencies...Overall, its key features all combine into a book that would benefit both veterinary practitioners and students alike- providing a useful revision tool to both parties, as well as encouraging the advancement of knowledge across the haematological field." "This practical book combines clear explanations of the various sampling and coloration methods, physiology of the blood cells and an impressive collection of pictures.Where relevant, clear boxes summarize the key clinicak features and diagnostic hypotheses...This is a good tool to sit next to the microscope." "This book is designed as a ready reference for all with an interest in veterinary haematology, from the student of veterinary medicine through to t he specialist in clinical pathology. This is a new edition of a previously published book and I think it will be universally seen as an improvement on what was already an excellent resource. Without doubt, the feature of this book which distinguishes it as a must-have is the number and quality of illustrations, both photomicrographs and drawn figures...The style of this book is to present haematology from a physiological and pathophysiological perspective. Chapters are divided into sections on erythrocytes, leucocytes and coagulation, rather than being divided according to diagnosis: for example, infectious diseases, neoplastic diseases, intoxications. As a clinician I find the chosen approach more useful as it supports a problemoriented approach to the case management style of learning more than the scholarly approach to learning which starts with the diagnosis and works backwards.